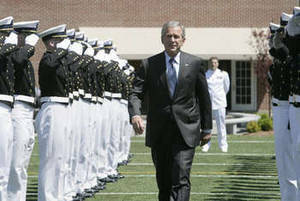 President George W. Bush (Republican) is now more popular than President Barack Obama (Democrat). This equals a result of -21%. Yes, -21% is President Barack Obama's Presidential Approval Index on Friday, March 19, 2010.This Rasmussen poll news is nothing new. In Obama's Poll Numbers Are Falling to Earth, written by By Douglas E. Schoen and Scott Rasmussen, and published in the Wall Street Journal on March 13, 2009, (a little over 1 year ago), the writers stated that, according to the poll data on that date, "Mr. Obama's approval rating is dropping and is below where George W. Bush was in an analogous period in 2001." Obama's Presidential Approval Index rating on March 13, 2009 was 6%.